Gun trusts, while sometimes confused with conventional living trusts, must be specifically and carefully drafted to avoid causing inadvertent and accidental felonious behavior by grantors, trustees, and beneficiaries of such trusts. This publication will teach attorneys the legal requirements necessary to make valid testamentary transfers of firearms and help them and their clients stay out of trouble. Key drafting elements and options of gun trust planning are covered. This comprehensive, stand-alone publication is direct from a November 2012 seminar. It is available as a searchable PDF via download. Click here for more information on electronic books. Copyright © 2012 Virginia Law Foundation. All rights reserved. Virginia lawyer for less than three years? 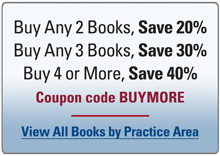 Use coupon code NEWLAWYER and receive a 25% discount on this and most other publications and seminars. Learn more.